Understanding the levels of instruction in the Bhagavad-gita can help us comprehend the overall unity of Lord Krishna’s message. The Bhagavad-gita is no doubt a major spiritual treatise and one of the world’s greatest classics. Understanding that a hierarchical concept of reality characterizes the Gita can help us see coherence of the Gita’s message. The Bhagavad-gita speaks on two major levels of reality and a third, intermediate, one. We can use the Sanskrit words dharma and moksha to treat the two main levels, and the word yoga for the third. Dharma refers to a set of values representing duty, religion, morality, law, order, and justice, which together sustain civilized human life. Yoga refers to the attempt to detach oneself from worldly life while trying to yoke oneself to the liberated state. Moksha refers to the liberated state of perfection and eternal existence in pure devotional service to the Supreme Lord, Sri Krishna. The level of dharma represents the human or worldly condition, the level of moksha represents the real or absolute condition (liberation), and the level of yoga is intermediate. We can also define these three levels as the finite, the intermediate, and the infinite. We can distinguish each level in terms of values and “being.” For dharma, the general rule in terms of value is to prosper. At this level, one desires worldly happiness and prosperity, seeing these as good. In terms of being, one see the living entity as the body, whether as a human being or as some other species. On the second level (yoga), one rejects worldly prosperity, valuing instead detachment from the world and indifference to both worldly happiness and worldly distress. On this level, one also yokes oneself to a higher reality, that of moksha. In yoga, one values the superiority of being equal-minded towards both happiness and distress and seeking absorption in Brahman. In terms of being, one no longer perceives of oneself or others as the body but as eternal spirit souls bound by the laws of samsara. On the third level (moksha), one replaces the indifference and detachment of the second level with deep love and attachment for the Supreme Person. As for being, the awakened spirit soul of the second level now becomes a pure servant and a lover of the Supreme Person. The three levels represent internal mental states or attitudes. Thus, one who sees the world from the point of view of the first level is convinced that he is a human being and that his aim is to prosper. On the second level, one is convinced that he is an embodied spiritual self and that his aim is to get released from that condition. On the third level, one sees the Supreme Lord everywhere and tries to love and serve Him. We can use a three-story house as a metaphor. Each story contains unlimited opportunities and paths. Moreover, the residents of each floor have their own language, terms, and assumptions. In a sense, the Bhagavad-gita speaks in three languages and constantly moves between the three levels. Once we recognise which level a particular text or section is on, that text or section becomes intelligible and we can see how it is consistent with the rest of the treatise. When Arjuna argues against fighting the war, he does so from the first level. We can examine his arguments according to the two parameters previously mentioned: values and being. Regarding values, it is clear that underlying Arjuna’s speech is the desire to achieve worldly prosperity. One of his main points is that the war would cause the decline of dharma and the rise of adharma, and thus suffering would come upon the world. As he believes that prosperity is good, he objects to the war. In terms of being, Arjuna thinks of himself and the others there as human beings. Krishna doesn’t answer Arjuna directly, but raises the conversation to the second level. In Krishna’s reply the values He propounds are utterly different; Krishna does not accept the idea that worldly prosperity is good, but calls for indifference to (and endurance of) both worldly happiness and worldly distress. He says these are impermanent and produced by sensual perception alone. As for being, Krishna does not refer to the soldiers present as human beings; rather, He refers to them as spirit souls. By not directly answering Arjuna’s doubts about fighting, Krishna performs a kind of a “Copernican revolution,” changing the underlying assumptions of the conversation. Arjuna argues that killing his relatives is bad, an obvious first-story statement that assumes that people are subjected to death and that death is to be avoided as far as possible for the sake of a prosperous life. Krishna doesn’t answer Arjuna’s arguments, but shifts the conversation to a different level altogether and speaks out of different assumptions. Basically He says that death doesn’t exist at all (a second-story assumption) and therefore He doesn’t see much logic in Arjuna’s arguments. Also, Krishna challenges Arjuna’s idea that worldly prosperity and happiness are good and to be desired. He propounds the idea that indifference to both happiness and distress is good and desirable. As such, He speaks from a second-story position. As a practical scripture, the Bhagavad-gita offers the means for crossing the gap between the first level (dharma) and the third (moksha). Mere following of dharma while avoiding adharma is not sufficient to attain the stage of moksha. One needs a different type of endeavor or path. This process or enterprise is sometimes called self-realisation, and it involves a transformational path by which one progresses step by step, thus making advancement from the lower level to the higher one. 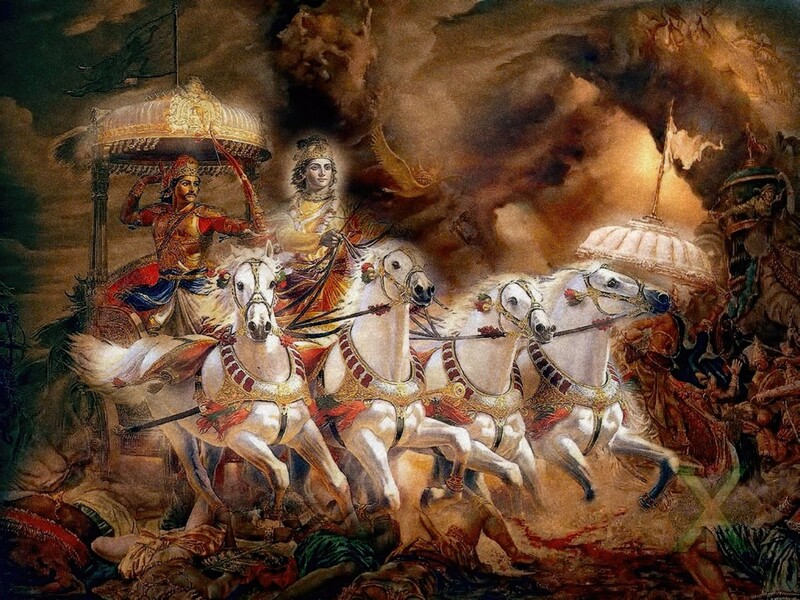 What practical means or system does the Bhagavad-gita offer? A major question raised in the Bhagavad-gita is whether one should choose the path of action or the path of contemplation. Arjuna raises the question twice, at the beginning of the third and fifth chapters. The Bhagavad-gita clearly recommends the path of action as the means by which the performer is to be elevated all the way from the level of dharma to the state of moksha. One performs this uplifting action according to one’s dharma and continues to work within the dharmic framework all along the way. Thus, Krishna encourages Arjuna throughout their conversation to follow his dharma and fight. However, as the text progresses, Arjuna’s motives for fighting are refined. Krishna shows Arjuna how he can fight in higher and higher inner states of consciousness. Thus, although externally we continue to carry out our prescribed duty, we undergo an internal transformation through sublimation or purification of our motives for performing action. In this way a kind of ladder is formed, by which one rises higher and higher, from dharma to moksha, along the path of self-realization. At the lowest stage, one’s actions are motivated by utilitarianism, or the desire to achieve something for oneself. Krishna first uses a utilitarian argument to try to convince Arjuna to take up arms. He assumes that Arjuna aspires to accumulate gain, such as fame, and argues that by withdrawing from the battle, Arjuna will loose his fame. In other words, Krishna advises Arjuna to follow dharma to achieve some end in this life or the next. Still higher is following dharma for its own sake, or performing one’s duty for the sake of duty. That stage represents a pure mode of action, free from desire for its fruits, and is one of the central teachings of the Bhagavad-gita. It is still within the first story, however, as it doesn’t include an awareness of the ultimate good, which according to the Bhagavad-gita is release from samsara. Still, those who follow dharma for its own sake reach the top of the first level and can progress further, into the next stage. 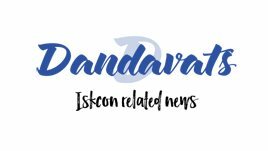 The next stage rejects the value of the Vedas, considered to be engaged with worldly gains, in favor of a higher ideal: the attainment of Brahman. We can call this stage “action for the sake of the highest good (Brahman).” He who thus acts is situated in the second level, characterised by various yoga processes. He may act now in karma-yoga; uninterested in the fruits of his actions, he offers those fruits to the Supreme. He may practice jnana-yoga, ashtanga-yoga, or bhakti-yoga. All these yoga practices have the common goal of detaching oneself from worldly existence and attachments and fixing oneself to the Supreme. Enlightenment and renunciation characterize the stage of yoga. Having perfected that stage, we finally elevate ourselves to the third story, that of moksha, and continue to carry out our duty in a deep, pure, spontaneous, and unalloyed mood of loving devotion unto Krishna. We’ve added some steps to our basic three-step ladder. Now we can summarize the stages as simple utilitarianism, dharmic utilitarianism, duty for its own sake, acting for the sake of the highest good or Brahman, the stage of yoga, and the stage of moksha or pure devotion. On this ladder of motives, the higher one’s motive for action is, the higher one is situated in the Bhagavad-gita’s metaphysical structure. In this way the Bhagavad-gita encompasses the entire realm of existence while encouraging all to ascend the ladder of motives, thus distancing oneself from samsara and absorbing oneself in Brahman. 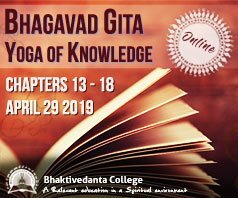 Following this structure, a student can make sense of the Bhagavad-gita as a coherent theological-philosophical treatise, firmly tied together as a single and unified text. It can offer a model for a three-story house in which the whole world can reside.